An influential taxpayers group has taken a skeptical look at San Diego Councilman Mark Kersey’s “Rebuild San Diego” ballot proposal to pay for billions in city infrastructure needs. In so doing, the San Diego County Taxpayers Association, a GOP-allied nonprofit, found itself critiquing a Republican’s plan on the eve of Tuesday’s council meeting, when the measure will be considered for the June ballot. The measure should be able to be suspended with a supermajority vote of the City Council, to enable flexibility in crises or emergencies. Baseline programmatic expenditures should be allowed to increase along with the Consumer Price Index. The proposal must include a narrow, concise definition of infrastructure. The proposal must contain a maintenance of effort clause to prevent newly gained funds from being diverted to other budgetary items. Council should consider limiting the duration of the ordinance to 15-20 years. The performance of the ordinance should undergo regular evaluation by the city. Endorsed by Mayor Kevin Faulconer, Kersey’s plan is a charter amendment expected to secure up to $5 billion over the next 30 years. “It commits three revenue streams to capital and maintenance costs associated with neighborhood infrastructure, including streets, sidewalks, storm drains, park and recreation facilities, libraries, and police and fire stations,” the mayor’s office said. 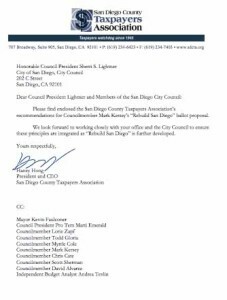 In a five-page letter to the mayor and council, SDCTA’s Hong applauded “Kersey’s determination to tackle the city’s pressing infrastructure needs,” but found fault. The GOP vs. GOP dynamic is unusual, however. In 2010, San Diego Mesa College political science professor Carl Luna questioned the nonpartisan claim of the SDCTA. New SDCTA board Chairman Barry Jantz took exception to Luna’s observations. “I’ve yet to see a policy discussion at SDCTA ever take into account the party registration of a measure’s proponent,” Jantz told Times of San Diego. 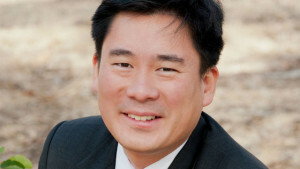 On Tuesday, President Hong said via email that his group was not aligned to any party.